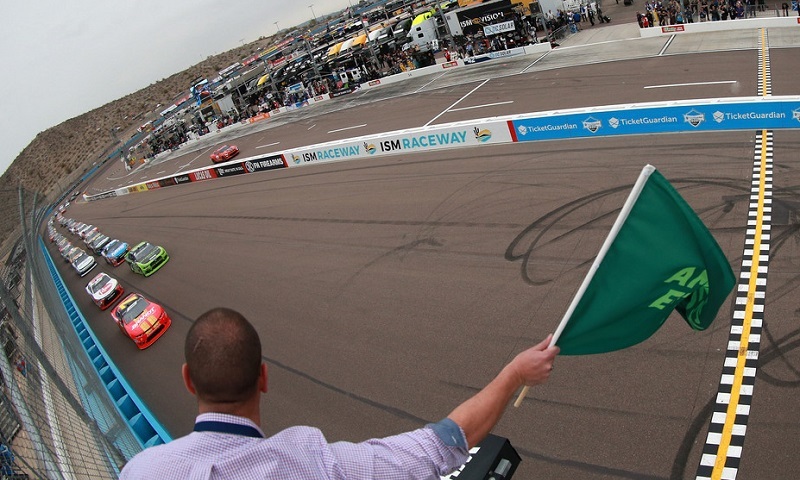 AVONDALE, Ariz. – Polesitter Justin Allgaier took off early and then charged late to win the opening stage of Saturday’s DC Solar 200 at Arizona’s ISM Raceway, banking a playoff point in the process. Allgaier led a combined 22 of the first 45 laps at the one-mile desert oval, but it was a restart with 12 to go in the first stage that allowed the Illinois native to pounce, powering through on the bottom lane after then-leader Brad Keselowski got a sluggish start when the green flag waved. Despite a scare two laps later, when Keselowski got sideways in turn two and nearly collected Allgaier from the bottom of the track as he came up into the side of the No. 7 BRANDT Chevrolet, Allgaier held on to collect his fourth-career NASCAR Xfinity Series stage win and first of the season. Under the stage break, the skies opened above the track and substantial rain began to fall, drawing the red flag with 47 of the 200 scheduled laps complete at the time the field was brought down pit road. Allgaier is seeking his second-straight spring win at Phoenix, following his victory there last year, and said that the caution for weather actually helped him from having bigger issues from the contact with Keselowski. “There’s actually a pretty big gouge in the side of the (right rear) tire, right where the tread meets the side wall, so I’m glad that the caution for the stage came out at the end there, because I’m not sure how much longer that thing would have made it,” admitted Allgaier. Though Allgaier was the dominant force in the opening laps, it was Keselowski who charged the inside lane of the track and fought his way to the lead on the 11th round, opening up a near-one second advantage over the next 15 laps before the caution waved for David Starr’s blown motor in turn three. That led to the stage’s only restart on lap 34, where Allgaier got the jump on Keselowski’s inside and then held on after Keselowski slid up into his door two laps later, with Kyle Busch, Christopher Bell and Daniel Hemric all fighting past Keselowski’s slowing car in the process. Bell was ultimately the one who got closest to fighting Allgaier for the stage win, but the reigning NASCAR Camping World Truck Series champion came up .636 of a second short at the green-checkered flag. Keselowski rallied back to cross the line in third and was apologetic about the contact with Allgaier after the conclusion of the stage. Busch and Hemric crossed the line in fourth and fifth, respectively. Jamie McMurray, Matt Tifft, Brandon Jones, Ty Dillon and Ryan Truex completed the top 10 at the first stage break of the day and all collected bonus points for their finishing positions in the stage. Of note, Cole Custer, Tyler Reddick and Elliott Sadler all made solid charges from the rear of the field in the opening segment. Custer just missed out on stage points in 11th, while Reddick and Sadler pitted during the caution for Starr’s motor trouble and were 17th and 20th, respectively.